Calling all Supernatural fans: Creation Entertainment’s Official Supernatural Convention is coming to Canada—and Random Acts will be there too! Staffers Natalie and Jessica are packing their bags and heading to the Westin Harbour Castle Hotel, Toronto, where they’ll be hanging out in the #SPNTor vendors room from October 6 through 8. Please be aware that Nellie’s isn’t able to accept donations of used clothing, toys, or cribs. What if I can’t bring items with me? If your luggage space is limited or you don’t have time to shop for items, don’t worry—we’d still love to see you! 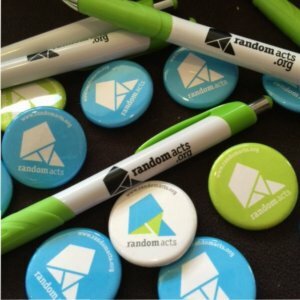 Make sure you stop by the Random Acts table in the vendors room for plenty of kindness-filled games, singalongs, and awesome swag giveaways. Are there any other ways to support Nellie’s? Sure! Even if you’re not attending #SPNTor, you can show your support by making an online donation. On a budget? You could consider honoring the great work Nellie’s does by getting kind for women and children in your area, such as by volunteering at a local women’s shelter. Whatever you choose to do, we’d love to hear about it via social media—remember to tag Random Acts in your posts and use the hashtag #GetKind. Will I get to meet Misha at the convention? Unfortunately, our co-founder is very busy and won’t have any free time for photos, meet and greets, or autographs outside of his allotted convention schedule. If you’re looking for an autograph or photo, please make sure to check Creation’s social media pages and website for ticket sales and updates relating to the convention. We also ask that supporters direct any messages or gifts/items to the proper channels rather than leaving them at the Random Acts table, as space is quite limited. To get all the latest updates over the #SPNTor weekend, be sure to follow our staffers on Twitter (@RAEventsTeam and @RARepUSNorthE), as well as following our main Random Acts social media channels.